The Zelda II Rev edition hack updates the graphics for Zelda II for the NES. Almost every enemy, boss, item and character in the game has received a minor or major changes. The over world tiles & palettes have also been tweaked. Many enemies and a few items now resemble the first Zelda game better. This includes Zoras, Wizards, wise men and more. Other enemies such as Gooma, bots, Megmats & wosus now look closer to the instruction manual artwork. A full list of changes is in the readme file. Overall it feels like the goal of the hack was met. Z2 is a great game, just unusually flawed and unbalanced for a Nintendo game. It felt like it just needed a little attention to it here and there. 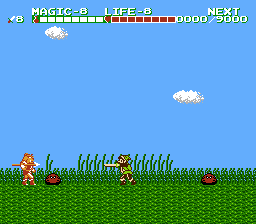 Having a sword that looks like a sword to visually gauge attack distance is where this all started. I did the sprites 5+ years ago, but never implanted them until now. Currently figuring out where to take this hack to. As I would like to keep it focused on improving & get into re-balancing the game. There is some more graphical work I would like to do, such as tinkering with palace back grounds, and the thunderbird's body. Some other ideas I was thinking was to replace some of the town items with ones from Zelda 1, such as the clock & food, and making the hammer a bomb... it wouldn't change what the hammer does but not having a bomb in a Zelda game feels odd. I think it might be neat for Link to fire boomerangs instead of fire for the fire spell... but this is beyond my hex knowledge. The palaces could use a bit of stream lining here and there so people wouldn't have to use online maps as much and some of the caves, and DM dead end caves could use some rewards, point bags or fairies to help balance the challenge vs reward aspect. Town people dialogue does need some changes. Some of it is just too derpy sounding. One thing I'm really keen on doing is re-balancing the magic system. It feels too costly to use and it feels like you always conserve it more than use it for healing and situation specific needs. Reducing the cost of magic and making the heal spell less effective to use would be a path to go. Link's defense could be adjusted to make up for the less effective Life spell. I have to say that your hack looks really good ! I might try it on my Everdrive soon. As for your question about spells turned into items, if my memory serve me correctly, Shadow of the Night does exactly that on one occasion. In the Great Palace, you have to search for the thunder spell and grab it like a normal item. Now, for a permanant effect, its a different kind of beast. Maybe the_icepenguin (the hack author) might enlight you on the matter ? I will start asking around soon. Finished up revamping the all the towns. Much more details than before. More minor sprite adjustments have also been done as well. The overworld has also received a little love here and there. Getting ready to tinker with the palaces. Right now most of them have only received very minor changes, made sure there was one fairy in each palace, point bag adjustments, etc. Wanted to make it worth the player's wild to explore them. Might remove some of the dead ends. The player being able to purely level up by exploring the entire game instead of grinding is one of the goals. The next build will probably come in 2 flavors. One that is purely cosmetic and one that rebalances some aspects of the game, such as magic usage cost, palace streamlining, etc. Changes i'd recommend is maybe insert more dialogue so people know where they're going and what to do for clarity's sake. For instance, Hidden Kasuto is about to come up and there like a lot of places you don't know what to do unless you know what to do. Maybe an NPC that mentions a hidden town to the north east and another that mentions the hammer being able to knock down trees. Admittedly I forgot I could do it til I started thinking about where to go next lol Other dialogue to clean up would be where to find the kid and going down chimneys. Maybe some that mention anti-fairies taking magic and life and Moas taking your exp and gimmicks for fighting bosses like using Reflect on Carock. Maybe adding a VWF hack would be nice for cleaning up the dialogue. Another nice change would be turning the magic meter into one long strip of green and the health meter being divided into heart containers. Aside from that, this is an amazing hack man. Currently i'm playing your hack to refresh myself on Zelda 2 so I can remake the game in a LTTP top down style and this hack is a LOT easier on the eyes. I'll probably be done before your next build is released but i'll mention your upcoming plans in the next few episodes. All good ideas to improve the dialogue. I will tackle the dialogue after the palaces. I have a list of what to do to them, nothing too crazy. Going to change some of their palettes, a few graphics & remove some dead ends. The great palace changes will focus on making sure the player can get to the end no matter which way they go instead going too deep & hitting a wall. @shade: I seen someone did a zelda version of z2 enemies. I don’t remember where. Most were pretty good, a few sketchy. Could be a good starting place for a top down remake. It was always weird the hidden town needed the hammer & the game never spoke of it clearing trees. Open to more ideas & suggestions to improve the game. It was a very enjoyable experience. Super satisfying and fun to play. If I had any other suggestions i'd maybe put Impa in the beginning and maybe add the prince and the sorcerer in either the beginning or the end. Several years after the events of The Legend of Zelda, the now-sixteen-year-old Link notices a strange mark on the back of his left hand, exactly like the crest of Hyrule. He seeks out Impa, who responds by taking Link to the North Castle, where a door has been magically sealed for generations. Impa places the back of Link's left hand on the door, and it opens, revealing a sleeping maiden. Impa tells Link that the maiden is Zelda (not the Zelda from the first game), the princess of Hyrule from long ago, and the origin of the "Legend of Zelda". Zelda's brother had tried to force her into telling their recently deceased father's secrets concerning the last of three sacred golden triangle treasures of his kingdom, known collectively as the Triforce. Princess Zelda refused to reveal its location, and the prince's wizard friend, in anger, tried to strike her down with a spell. Zelda fell under a powerful sleeping spell, but the wizard was unable to control the wildly arcing magic and was killed by it. The prince, filled with remorse and unable to reverse the spell, had his sister placed in the castle tower, in the hope that she would one day be awakened. He decreed that princesses born to the royal family from that point on would be named Zelda, in remembrance of this tragedy. Impa says that the mark on Link's hand means that he is the hero chosen to awaken Zelda. She gives Link a chest containing six crystals and ancient writings that only a great future king of Hyrule can read. Link finds that he can read the document, even though he has never seen the language before; it indicates that the crystals must be set into statues within six palaces scattered all over Hyrule. This will open the way to the Great Palace, which contains the Triforce of Courage. Only the power of the combined Triforces can awaken the enchanted Zelda. Taking the crystals, Link sets out to restore them to their palaces. Meanwhile, the followers of Ganon are seeking to kill Link, as sprinkling his blood on Ganon’s ashes will bring Ganon back to life. Ultimately, Link restores the crystals to the six palaces, defeating a strong guardian within each one to do so, and enters the Great Palace. After venturing deep inside, Link must battle a flying creature known as Thunderbird, followed by a shadowy doppelgänger of himself known as Dark Link. Link then claims the Triforce of Courage and returns to Zelda. The three triangles unite into the collective Triforce, and Link's wish awakens Zelda. The game ends as they (presumably) kiss under a falling curtain. You could also alter the story that the 'Wizard friend' was actually Agahnim/Shadow of Ganon controlling the Prince for intel on the Triforce and instead of dying, he gets what he wants and rushes off to the Great Palace where he later transforms into Shadow Link and attacks you. I feel that would link the game to Zelda 1 and LttP and the series in general. Seeing as Zelda 2 is the end of a potential timeline with no subsequent sequels, you could probably take a few liberties story-wise for the sake of clarity and continuity. Maybe mention that the blood of the Hero can be spread over Ganon's ashes to resurrect him too. I agree the saving another person named Zelda is was silly. The intro text in the hack was changed a bit to sound more like that. I’m not sure how I could add in more back story into the actual game outside of villagers telling u? Or maybe some npc’s hanging around sleeping zelda speak of it? An updated version should be up soon. It does include many dialogue changes as you mentioned & also the life meter is now hearts visually, it still functions the same. Never finished the game myself. If I'm following correctly, she's always been a different Zelda in Japanese continuity. 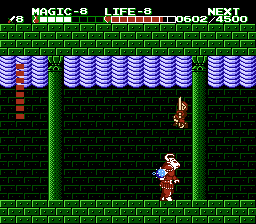 While the English NES version attempted to simplify the story by recasting her as the first game's Zelda. Yeah NPCs around Zelda could likely accomplish this. Impa could be by Zelda and maybe put the Prince at King's Tomb and have him regretting his actions and talking about Aghanim. The game really needs story and direction more then anything. The intro story isn't really enough when the game just kinda plonks you in front of Zelda and off you go wandering aimlessly. Maybe Impa can auto start talking and give you the basics of the story but reveal more optionally if you keep talking to her. You could also add NPCs to the empty houses throughout the game and have them reveal more story direction, where you're meant to go. I know you only really get one line per dialogue but if you can add a different line a few times in succession, suddenly a sentence becomes a paragraph and you have a lot more to work with. I dunno, just rattling off ideas man. I did look into many of your suggestions. Thought most would be simple hex value change, but it appears they would be a bit more. There are now a few more red jars and fairies scattered in the palaces to help things out. Once the reflect/shield combo spell is wrapped up & released, it will make difficulty curve for the first half of the game better. Second half benefits a bit from it. Currently planning to release at least one more build. It will be in 3 seperate patches for those that want just the sprites, what is out now and also a version with the spell changes. Great work Revility. I'm using your hack as a basis for my hack, and I'm close to finish. What I would love to see someone do is create a way to have all boss characters in The Great Palace. That would make playing the Thea Palace a more epic experience as opposed to just adding near impossible platforming. I don't know enough about hacking and editing to know if it's possible, but it would be cool if someone can figure it out and do it. I bumped into a fatal bug. I was playing the game normally, until I found out that the second palace was already transformed into stone even before I could enter it. Not sure what could have caused that. The code that checks for completed palaces has been modified, however I didn't take the time to analyze it. I checked my original ROM's SHA checksum and it's fine. So I'm stuck for now. just double checked the issue and was able to confirm finishing the first palace set the castle for both palace 1 and 2. I will look into getting this fixed pronto. It looks like after beating the first palace, both the 2nd and 3rd turn to stone as well. Very odd. I thought this had been fully tested through before release. A temporary replacement build has been submitted. This build contains only the graphical, dialogue and pallet changes found in 1.5.00. The sideview, overworld, and magic related changes are not in it. I had planned to release this version separately for others to easily use the hack to start off their own projects. Until a fix for the palace rocks is found, this will do. After a long process with Nintendo after they blocked the first episode worldwide, we reached something of a compromise. I had to removed the links to your hack and re-record the first episode (with the current build) but I make sure to mention your name and the hack name as much as I can. Sorry dude, I feel back but for the sake of a complete series, I had to comply. I gotta re-record a few episodes of ShadowOne333's LttP too. Either way, loving your new changes. Your version will always hold a special place for me dude.